I've always been a coder at heart. Since I was a kid all I've wanted was to create cool things with computers - well, and play video games. SmartyPantsCoding is my hub for all the apps and games I create and the home for my ramblings about a variety of topics and technologies. I like to write games that are simple and fun to play. The best word scramble game on iPhone, iPad, and Android devices. Unscramble thousands of jumbled words with simple touch gameplay to expand your vocabulary and word recognition. The best word search game on Android, Windows 8, and Kindle Fire. Intuitive gameplay, and interesting puzzle book topics. A modern twist on the memory matching card game you played as a kid in full 3D with combo multipliers, explosions, and tons of customization options. Help our friendly castaway navigate the waves as he tries to survive another day on a deserted island. Enjoy this full featured blackjack game inspired by the Metro design system of Windows Phone. Race through over a dozen user submitted mazes to see how you stack up in this Samsung Galaxy Note exclusive. I like to write apps that are innovative and utilitarian. 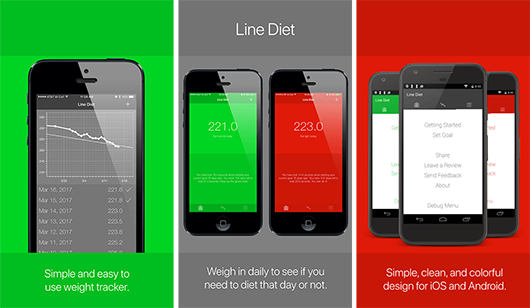 The simplest app for keeping track of your weight loss goals. Find out daily if you need to diet or can take it easy that day and still meet your long-term goals. Watch an endless stream of images as they are posted to Instagram, Twitter, and Flickr. See what people are really doing on the social web. I was invited to speak at the Atlanta Xamarin Users Group this week, and I decided to share a bit about the Xamarin.Forms work I've been doing of late. Over the last 6 months or so I have worked on 4 different Xamarin.Forms projects. In the process I've been amazed at how powerful the technology stack is, and pretty well delighted with how it can be customized to brand apps. 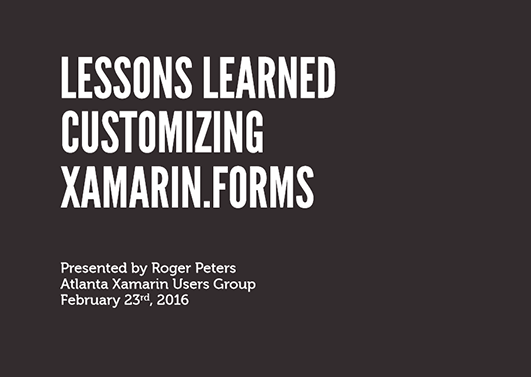 In this talk I covered the basics of evaluating between Xamarin and Xamarin.Forms and covered customizing Xamarin.Forms per platform in a variety of ways. If you came to the meetup, thanks a bunch - I was excited to even learn something myself that night from another member. Also, big congrats to Xamarin for being acquired by Microsoft this week. I can remember Miguel De Icaza speaking on Mono (and even Unity) back in 2008 at PDC. To see how far both of those projects have come over the last 8 years is amazing, and I can't wait to see how Xamarin takes off from here.